Internet Explorer 11 is the newest version of the Microsoft's mobile web browser. You bet it went through an extensive upgrade and is a marked improvement over previous versions. IE 11 is what the Windows Phone browser should have been from the get-go. Microsoft took several cues from the competition and now provides private browsing, reader mode, unlimited tab support with new UI, saving passwords, tab and bookmark sync across devices and support for inline videos to name a few. Back and Forward gestures have been added too - just swipe from the left or right edge of the screen. Yes, just like in iOS. The first new feature you'll notice is the unlimited tab support in IE 11. The tab manager has a new UI too, plus a dedicated shortcut right next to the address bar. InPrivate browsing is available too, you can launch a separate incognito tab from the tab manager. Once you open an article on the web you'll notice a small book icon appearing in the address bar. If you tap it you'll activate the so-called Reader mode. It does the same as its iOS namesake - it strips down everything but the article itself and its pictures. This way you can enjoy seamless reading of long articles without any unnecessary content or ads. You can configure the Reader background color and font size from the IE 11 settings. IE 11 also supports inline video playback. In case the browser is capable of playing an embedded video, you will be able to do it right from within the article. No external players or pop ups are needed. Much like its Android and iOS counterparts, the new web browser supports tab and bookmark sync across devices. This means you can start exactly where you left off on IE on Windows PC or slate. By the way you can pin web pages to your start screen. 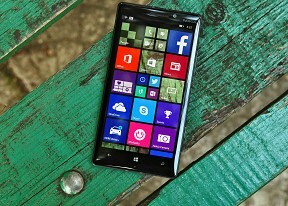 You'll get a Live Tile, which will show the latest updates to this website. The Internet Explorer 11 web browser, just like the overall UI, seems to be faster, with excellent page loading times and scrolling performance. We've enjoyed the new version and we think you'll like it too. Office is one of the key selling points of Windows Phone. Document/Excel/PowerPoint viewing and editing is absolutely free and integrated into the OS. OneDrive integration is available as well. Docs are automatically synced between the phone and your computer through OneDrive. OneNote is Microsoft's collaborative note taking tool. It has great (and easy to use) support for lists of multiple levels, and you can add photos and voice memos or send notes via email when you're done. OneNotes can be synced with your OneDrive as well. The Calendar app can view sub-calendars for each account you have and can color-code them to make them easier to tell apart. It offers day and agenda views for more comprehensive hour-by-hour browsing of your appointments. Weekly view makes the days expandable in case you have more events than the small square can show. This mode even searches for weather forecast and displays it with small icons on each day. Naturally, Lumia 930 comes with Alarm, Calculator, and Weather apps pre-installed. Microsoft's Travel, Sports, Finance, Food & Drinks and News apps are available, too. With the Lumia 930 you get a few Nokia exclusive apps - Storyteller interactive diary, Creative Studio for advanced photo enhancements, and, of course, HERE Maps and HERE Drive+. HERE Maps takes on other duties - instead of navigation, it's more of a replacement for paper maps that you can take as you explore a city. It will help you discover new places, read a quick description, see photos, read reviews and check what renowned guides like Lonely Planet, Insight Guides and Qype have to say. Windows Phone's traditional Games app is present - it carries over many features from the similar Xbox profile - from your avatar to your scores and achievements. It is also your gaming hub - here you can find all of your pre-installed games, spotlight news and store links. Finally, Windows Phone 8.1 introduced a couple of new apps: Storage Sense and Battery Saver. Storage Sense tracks your internal memory and allows you to configure which content will be saved where. Battery Saver now not only shows you the battery percentage and allows you to configure when the battery saver goes on, but it can now track battery usage too. You can also allow or restrict apps to run in the background while the battery saver is turned on. By the way, the Microsoft Store now supports automatic app updates. You can choose whether those happen only when connected to a Wi-Fi network, or if cellular data is allowed as well. Check for updates button is available, but now the Store checks for available updates quite a few times a day, so you probably won't need to use this key regularly. Windows Phone 8.1 on the Lumia 930 supports motion data collection in the background. This process runs on the background and collects data to track your movement and location. Supposedly, this won't affect battery life. It's a useful feature for fitness fans and can be used by various health-related apps including the pre-installed Health and Fitness app.